What is Evenstar’s Chalice? We are more than a retail shop, we are a sanctuary of ‘living altars’, a place to honor and give intention to those stories we all live in. We are, after all, amazing storytellers, and we cannot help but make space and placement for those stories in our daily lives. Take a look around your home…Where do you lay the stories and ‘treasures’ of your journey? On a shelf? On the wall? On that little table over there? a wave of a hand, and the utterance of words. We tease at your senses, to open them more fully. Come, fill your chalice and play in the spirit of wonder! Whew! We had an amazing time and we hope you did too! 30 customers received surprise goody bags with mini altars inside. J.P. won the silent auction bid on the Larry Humphrey print for $150. $25 of those dollars will go toward hurricane relief. Another $35 was donated for hurricane relief via our donation chalice. M.C., K.O., & D.A. each won a chalice in our chalice drawing Friday evening. Natalie, Silent Heart, ScooterJ and Miriam are each lucky winners of the $50 gift certificates from the email list drawing. If this is you, check your email for details!! Much gratitude to Solo Duo, Lark and Reality for providing such amazing entertainment and joy! And, Bona Sera, yeah...mmmmmm great food! And last but not least, an immense amount of gratitude to all the love, excitement, and well wishes that came from everyone walking through our doors! 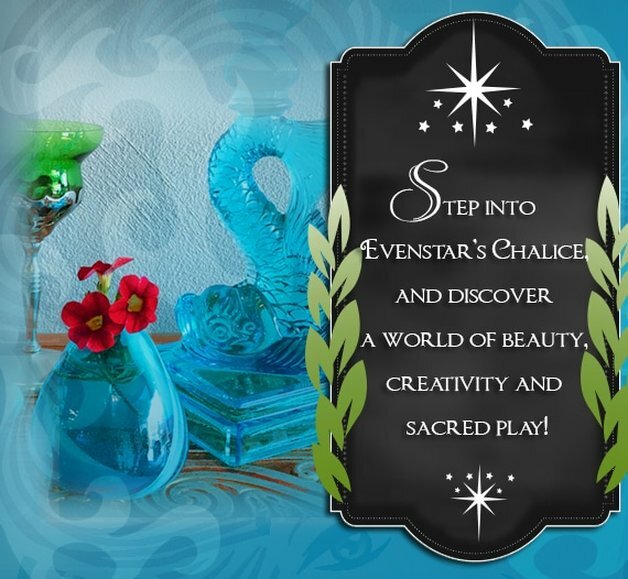 YOU are what makes Evenstar's Chalice so special.